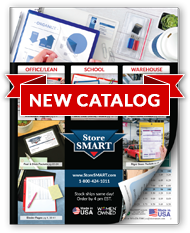 StoreSMART offers a simple and inexpensive defense: Anti-Theft RFID Blocking Sleeves, to help block the signals that expose your important information to illegal scanning. The sturdy sleeves fit in your existing wallet or purse, and easily slide over your credit cards, debit cards, driver's license and passport. StoreSMART's Anti-Theft Blocking Sleeves are made of reinforced materials, much more durable than the basic paper RFID blockers you may see elsewhere. The black sleeves come in two convenient sizes (2 2 ¼" x 3 ½" for credit cards, debit cards, and drivers licenses, and 3 7⁄8" x 5 ½" U.S. for passports).